“I do,” replied the rabbi. I think Rabbi Sacks was paraphrasing something else, but I looked up his Goodreads profile and added a few books of his to read later. To Heal a Fractured World happened to be the first I had time to read. One of the cruellest misrepresentations of Judaism is the claim that it is not a religion of love – despite the fact that the two great commands of love, ‘You shall love the Lord your God with all your heart, all your soul and all your might’ (Deut. 6:5) and ‘You shall love your neighbour as yourself’ (Lev. 19:18), both come from the Mosaic books. Judaism is a faith suffused with love, but infinitely transcending man’s love of God is God’s love of humankind. After reading Rabbi Sacks, I increasingly find that Judaism already contains most of everything I value in my Christian faith, and more, it contains many things for which I have holy envy, to use Krister Stendahl’s term. I will try to write about only a few of those gems here, and leave the rest for you to find yourself. Judaism is not a religion that reconciles us to the world. It was born as an act of defiance against the great empires of the ancient world, Mesopotamia and Egypt, which did what he accused all religions of doing – sanctifying hierarchy, justifying the rule of the strong over the weak, glorifying kings and pharaohs and keeping the masses in place. In the Bible God removes the chains of slavery from his people; he does not impose them. The religion of Israel emerged out of the most paradigm-shifting experience of the ancient world: that the supreme power intervened in history to liberate the powerless. It was in and as the voice of social protest that the biblical imagination took shape. Certainly, there is a type of faith that does teach us to be accepting of suffering, and I also think, to some extent, this is necessary. Not to accept suffering, but to be able to go on despite it: how we respond. And that leads to the next point: an ethics of responsibility. But Rabbi Sack’s responsibility has a different flavor. It removes a lot of the angsty-ness of it all. I can’t quite describe how, because all the suffering in the world is still there. Perhaps the best word is hope? Faith is built on hope, and that will always be there. The first eleven chapters of Genesis are not a mere series of historical narratives. They are a highly structured exploration of responsibility. They begin with two stories about individuals, Adam and Eve, then Cain, followed by two stories about societies, the generation of the Flood and the builders of Babel. The first and last – the tree of knowledge, the tower – are about the failure to honour boundaries: between permitted and forbidden, heaven and earth. The inner two are about violence, individual then collective. They constitute a developmental psychology of the moral sense. First we discover personal responsibility, our freedom to choose. Then we acquire moral responsibility, the knowledge that choice has limits; not everything we can do, may we do. Later we learn collective responsibility: we are part of a family, a community and society and we have a share in its innocence or guilt. Later still, we realize that society itself is subject to a higher law: there are moral limits to power. It arises from Judaism’s theological insistence on the difference between possession and ownership. Ultimately, all things are owned by God, creator of the world. What we possess, we do not own – we merely hold it in trust for God. The clearest statement of this is the provision in Leviticus: ‘The land must not be sold permanently because the land is Mine; you are merely strangers and temporary residents in relation to Me.’ If there were absolute ownership, there would be a difference between justice (what we are bound to give others) and charity (what we give others out of generosity). The former would be a legally enforceable duty, the latter, at best, the prompting of benevolence or sympathy. In Judaism, because we are not owners of our property but guardians on God’s behalf, we are bound by the conditions of trusteeship, one of which is that we share part of what we have with others in need. What would be regarded as charity in other legal systems is, in Judaism, a strict requirement of the law and can, if necessary, be enforced by the courts. The nearest English equivalent to tzedakah is the phrase that came into existence alongside the idea of a welfare state, namely social justice (Friedrich Hayek regarded the concept of social justice as incoherent and self-contradictory). Behind both is the idea that no one should be without the basic requirements of existence, and that those who have more than they need must share some of that surplus with those who have less. This is fundamental to the kind of society the Israelites were charged with creating, namely one in which everyone has a basic right to a dignified life and equal worth as citizens in the covenantal community under the sovereignty of God. I had to check myself for a minute, because I have read Hayek, and I have a knee-jerk reaction when anyone mentions social justice. It has been used to justify a lot of bad social programs. But after reading Sack’s book, I feel like I am not doing nearly as much as I should be in terms of caring for my neighbor. Sacks doesn’t argue for social programs, but for a taking on a mantle of responsibility for my neighbor. Latter-Day Saints too are committed to such a vision, covenanting to keep the law of consecration. But we seem to have absolved ourselves of any feeling of bringing this to pass in our lifetime. In Joseph Smith’s day, the natural man was just too strong, and only in a society composed of the strongest of saints could such a society succeed. Sacks says this is wrong. You begin doing good in your own circle now, and that good will spread and grow. You are your brother’s keeper. Even more so, the history of Judaism is a lively tradition of wrestling openly with scripture and coming to diverse conclusions about how to handle it. More so than the Christian tradition, Judaism embraces debate as a vital part of its faith. Disagreements are preserved (not silenced or marginalized) in official core texts of Judaism, like the Talmud and medieval commentaries on the Bible. Opposing opinions sit side by side as monuments to this wrestling match with scripture—and with God. To be a father – implies the Bible – is to teach a child to question, challenge, confront, dispute. God invites Abraham to do these things because he wants him to be the parent of a nation that will do these things. He does not want the people of the covenant to be one that accepts the evils and injustices of the world as the will of God. Each professor is—like all human beings—a flawed thinker with a strong preference for believing that his or her own ideas are right. Each scholar suffers from the confirmation bias—the tendency to search vigorously for evidence that confirms what one already believes.36 One of the most brilliant features of universities is that, when they are working properly, they are communities of scholars who cancel out one another’s confirmation biases. Even if professors often cannot see the flaws in their own arguments, other professors and students do them the favor of finding such flaws. The community of scholars then judges which ideas survive the debate. We can call this process institutionalized disconfirmation. The institution (the academy as a whole, or a discipline, such as political science) guarantees that every statement offered as a research finding—and certainly every peer-reviewed article—has survived a process of challenge and vetting. That is no guarantee that it is true, but it is a reason to think that the statement is likely to be more reliable than alternative statements made by partisan think tanks, corporate marketers, or your opinionated uncle. It is only because of institutionalized disconfirmation that universities and groups of scholars can claim some authority to be arbiters of factual questions, such as whether certain vaccines caused the rise in autism (they didn’t)37 or whether social programs designed to help poor children close achievement gaps with wealthier kids actually work (some do, some don’t). I think there are things that need to change in the Church. I think we worry too much about how things are supposed to be, that we are willing to sacrifice the needs of individuals to doctrinal purity. This is dangerous. We need both conservative and progressive elements in the Church, so let us value both. The final thing I wanted to comment on for which I have holy envy is the perceived relationship Jews have with those outside of their faith, the Gentiles. Jews believe in two covenants: the one made with Abraham that applies to the Jewish people making them a holy nation, and the covenant made with Noah that applies to all men. In essence, Jews leave room in heaven for those outside of their faith. I find this deeply profound, and it leaves room to respect those outside of their faith without having any need to feel some kind of spiritual condescension. Theoretically, Latter-Day Saints have something like this too: we have a form of universalism that all will be admitted to a kingdom of glory. But this doesn’t stop us from feeling like we are somehow better. We constantly assert that we are “the one truth Church.” I had a friend who left the Church because he couldn’t reconcile himself to this belief. I remember on my mission, our ward was invited to participate in an ecumenical communion, where different congregations would share the sacrament. Our ward turned down the effort, because everyone knows that only those who have true priesthood authority can bless the sacrament. I felt like despite that, we should have found a way to have interacted and responded positively to that invitation. I think we are lacking something here that Judaism has and that we should seek to recover. 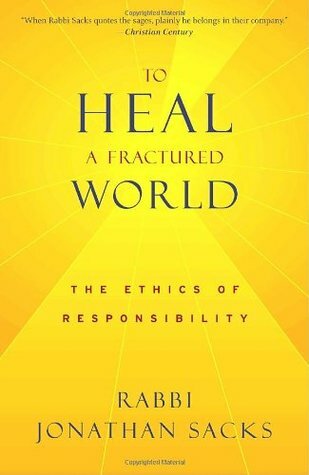 I am deeply impressed by the words of Rabbi Jonathan Sacks, and I think this book will truly help us heal a fractured world. May we take the invitation to be responsible, to be our brothers keeper.